Carolina Cotton was quite a versatile performer. Once known as the "Yodeling Blonde Bombshell". She was also a Rodeo Queen, appeared in movies, radio and televsion shows. She was the first 'daughter' to tour with the Sons of the Pioneers. She appeared in movies for the Warner Brothers, Universal, Columbia and Republic studios. One of her Columbia movies was "Smokey Mountain Melody". Carolina Cotton was also a disc jockey. She was on KGER out of Hollywood from 3:30pm to 4:00pm, Mondays through Fridays. 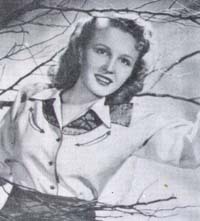 She was also a horsewoman appearing at Western parades and rodeos. She carried a nickname of "Queen of the Range" then. When she rode in those events, she used her famous 24-karat gold saddle that was made in Mexico. Carolina was about five feet five inches tall with blue eyes. Country Song Roundup No. 5; April 1950; Charlton Publishing Corp.; Derby, CT.